Yes, the old arm is up and running again, and so I have been (gently) storming back into my knitting. Nice picture, eh? Why don't I pick something blacker to photograph? 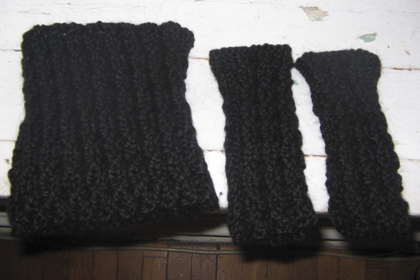 It is a high neckwarmer (in that it is tall, not that it only warms your "high" neck....oh forget it, you know what I mean) and fingerless gloves, in mock cable rib, out of Baby Alpaca Grande, my favorite yarn to make gifts out of. 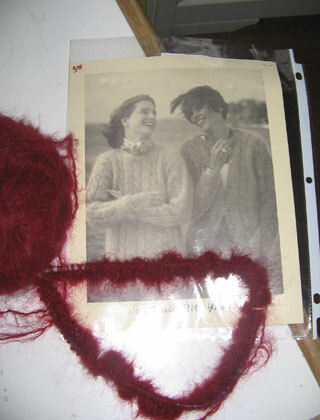 which will be the Cabled Pullover, in dark red LaGran Mohair, for the Tangled Web's next knit-along. 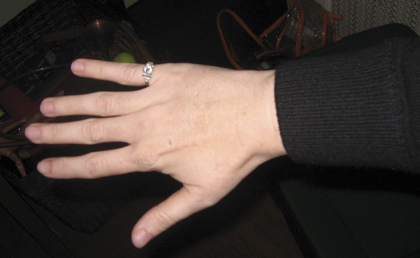 I was going to knit the cardigan option, but I realized that though I say I love cardigans, I wear pullovers more. 'Nuff said. I had to go down to #6s to get gauge while the pattern recommends #9s (and even then it was kind of dicey), so who knows how it will turn out? Either monstrously huge or just right. It's an adventure!! Last night, for my birthday, we went to Jonathan's at the Jenkintown train station for dinner (if you go to "gallery" at their website, you can see the excellent bar). We sat at a booth in the bar, so Gus (and we) could watch all the trains coming through. Excellent! The food was delicious. I had crabcakes, Matthew had salmon, and my mini-gourmand had calamari and macaroni and cheese, a particularly felicitous combination. I received this for my birthday (from me, ordered gift-wrapped a month ago and sitting in my closet since). I glanced through it yesterday. It may be the most mighty book ever written. Once I plunge into it, I may not emerge for a year or so. I want to make every single project in it. Oy. Tomorrow Gus and I can go pick up our stuff from Colour Me Mine!!!! I can't wait!!!! Can you?? Cause I'm gonna post pictures of all of our stuff!! You can't stop me!! Wa ha! My manager and I were laughing about that book this morning! Believe me, there are some customers that I'd like to take a whip to. And not in a good way. CRACK!! So sorry to have missed your BIG DAY!! As my friend Bess would say, celebrate yourself all month long - hon, you're worth it.